In Suriya, Tamil cinema has found the ideal combination of an actor-star. He is not only a hugely saleable star but easily one of the best actors in mainstream Tamil cinema today as his powerpacked performances in films like Nandhaa (2001), Pithamagan (2003), Kaakha Kaakha (2003), Perazhagan (2004), Gajini (2005) and, in particular, Vaaranam Aayiram (2008) testify. Suriya is one of those rare actors who is able to reinvent himself with each film he does and today being in a position to pick and choose, he makes sure he does only those films that give him an opportunity to do so. The son of actor Sivakumar, Suriya was born Saravanan Sivakumar on July 23, 1975, the eldest of three children. He did his schooling from St Bede’s School, Chennai before graduating in B Com from Loyola College, Chennai, where he was said to be an extremely introverted and shy student. He dabbled in the garment industry for a bit before deciding to enter films. Suriya’s first film was Nerukku Ner (1997), wherein he co-starred alongside Vijay, Simran, Kaushalya, Raghuvaran and Prakash Raj. No doubt, he brings a certain freshness to the film and there are sporadic moments when he does show glimpses of his boyish charm but that’s about it. He often appears ill at ease as if not wanting to totally open up in front of the camera and, in particular, in the romantic and song sequences, he is plain awkward. Though Suriya continued to do films steadily post Nerruku Ner, he first broke through as an actor of merit only in 2001 with Nandhaa. In the film, he plays a young man out of a juvenile reform home after years (where he was sent after murdering his father when still a boy) who tries to build his life freshly by getting himself educated in college and tries to make something of his life, while hoping to earn his mother’s love as well. Suriya shows great intensity and is perfect as the brooding loner craving love from his mother. It is a subtle, understated performance that has its share of high moments yet is a little raw in places, no doubt. The film got Suriya great critical acclaim and he went on to win the Tamil Nadu State Film Award for Best Actor for the film. The same year, he also had a huge commercial success with Friends, co-starring Vijay, Devayani and Vijayalakshmi. 2003 was Suriya’s real breakthrough year as he scored heavily in both the films he did that year,Pithamagan and Kaakha Kaakha. In the former, he co-starred with Vikram and played a likable conman who befriends and humanizes Vikram. Suriya gives the film its lighter moments and manages to create an extremely likable character consequently giving his death the solid emotional wallop it required. Though the film was an out and out Vikram show for which Vikram won the National Award for Best Actor as well as the Filmfare Award for Tamil Best Actor, Suriya more than held his own in the film winning the Filmfare Award for Tamil Best Supporting Actor. Kaakha Kaakha remains one of Suriya’s finest films. In the film, directed by Gautham Vasudev Menon, Suriya plays a tough cop who has little time for a personal life till he falls in love with a Maths teacher played by Jyothika. 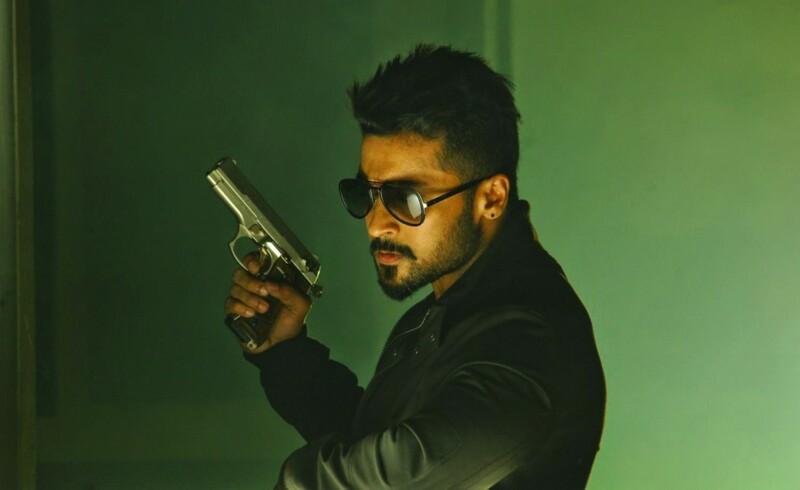 Though essentially, a hard-hitting cops v/s the underworld tale, Suriya shows his ability to rise above the script and delivers a knockout performance. He is perfectly understated as the brooding loner and responds with a finely nuanced and well internalized performance as he simmers beneath the surface to explode finally in the climax. The film, further enhanced by Gautham Vasudev Menon’s sure-handed direction and a great musical score by Harris Jayaraj, was a huge success at the box office. Suriya was now one of the most reliable performers in Tamil cinema both critically and commercially. 2004 was another great year for Suriya. His wonderfully enacted double role of a rough college student and a hunch-backed, selfless villager in Perazhagan won him the Filmfare Award for Best Tamil Actor. In particular, as the ugly and deformed Chinna, who covers up his handicap with talk and humour, he is astounding to say the least. Just look at his body language, his walk, his voice, his way of talking in this role. He gets you totally involved in the proceedings, makes you feel deeply for his character and consequently, he makes you laugh, smile and cry with him. He rarely strikes a false note and is highly endearing in the lighter sequences with his comic timing spot on while he makes sure the film gets its necessary emotional wallop in the more serious sequences. Suriya also worked with Mani Ratnam that year in Aayitha Ezuthu, the Tamil version of Yuva. Suriya plays the role of a student leader whose ideology is that students and youngsters must involve themselves with politics for the future of the country. It is a finely modulated performance and Suriya, in fact, scores over Ajay Devgan’s interpretation of the role in the Hindi version as the latter looks far too old for the role to carry off being a student convincingly. Gajini proved to be yet another landmark in Suriya’s career. He is absolutely spot on in this Memento inspired tale of a businessman with a limited memory timespan of 15 minutes, who is trying to find his girlfriend’s killer. Suriya carries off the various shades of his character, be it the businessman who gets endearingly goofy in love or the vigilante working against time, beautifully and though the Hindi version sees no less an actor then Aamir Khan take on the Suriya role, it has to be said here Suriya’s performance holds up far better. The film won Suriya the Tamil Nadu State Film Award (Special Prize) for Best Actor. In a career, already full of memorable performances, Suriya’s greatest performance undoubtedly came in Vaaranam Aayiram, re-uniting him with director Gautham Vasudev Menon, post Kaakha Kaakha. Playing a dual role of father and son, he is simply brilliant in the film, especially as the father. His body language, mannerisms, soft-spoken, warm nature are all beautifully done. Suriya carries off the different ages of both his characters beautifully, the father from college days to middle age to old age and the son from his teens to his 30s. He rarely hits a false note in the entire film as both his characters go through a varied range of looks and emotions. It is one of the great performances in mainstream Tamil cinema and has deservedly won Suriya the Vijay Award, the Tamil Nadu State Film Award (Special Prize) for Best Actor and the Filmfare Award for Best Tamil Actor. The film itself won the National Award for Best Tamil Film. Suriya’s next film, Ayan (2009), however, was a disappointment qualitatively in spite of a brilliantly executed action sequence in Africa, a couple of well composed songs and his efficient enough central performance. It was a huge success at the box office, though, and the biggest commercial success of Suriya’s career till date. And continuing in the same vein, his next two films, Aadhavan (2009) and Singam (2010) have also been the big, commercial blockbuster type films. Their triple success has more than vindicated Suriya’s choice in doing these films and it has to be said that even if they haven’t challenged the actor in him as much as one would have liked, he is a big, big reason for these films being hits. Suriya’s Hindi Debut, Rakht Charita -2 (Rattha Charithram in Tamil, Rakta Charitra – 2 in Telugu), saw him garner fine reviews yet again for his work as he plays Paritala Ravi’s nemesis, Suri, who masterminds Ravi’s death from jail. Suriya dubbed for himself in the Hindi version as well and did a reasonably good job though the discomfort with Hindi does show in places. The Tamil version sees a more fluid performance from him and his dubbling and voice modulation here in expertly capturing the emotions of his character in his own language is simply superb and adds layers to his performance. The films, however, were let downs to say the least. As have been Suriya’s subsequent films, 7aum Arivu (2011), Maattrraan (2012), Singam II (2013), Anjaan (2014) and Massu Engira Masilamani (2015). Of all of these hugely budgeted films, at least Singam II, in spite of being a disappointing follow up to its predecessor, did well at the box-office, while the others made little headway at the ticket counter. Suriya is poised at the peak of his career as an actor today. One hopes he now picks the right scripts and projects that go beyond standard commerical fare and also do justice to his ample histrionic ability. Especially since current Tamil cinema is doing some extremely innovative and exciting work within the mainstream format much as Malayalam cinema in the 1980s and early 1990s. Suriya has also dubbed for Abhishek Bachchan in the Tamil version of Guru and for Aamir Khan in the Tamil avatar of Taare Zameen Par. Outside of films, Suriya is also actively involved with his Agaram Foundation that supports education for children in backward areas,. He is also a strong supporter of the anti TB DOTS scheme, the Tanker Foundation for Kidney patients, the Aircell initiative for Save Our Tigers and the cause of autistic children. He also tries to make sure that his fan clubs across the state contribute to building socially aware citizens who work for the community they live in. On the personal front, Suriya is married to his Kaakha Kaakha and Perazhagan co-star Jyothika. The couple have a daughter, Diya, born in 2007 and a son, Dev, born in 2010. #Suriya is the best actor in the kollywood am big fan of #Suriya anna. No one never ever do romance scene like suriya anna, nerrukku ner, kaakha kaakha, pithamagan, ghajini, vaaranam 1000, ayan, singam, is my favorite film..:p and masss non-stop hits…. !